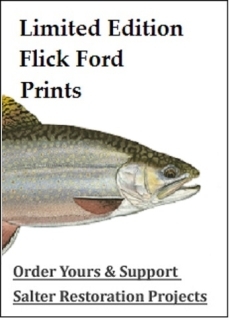 Below follows an ever evolving list of published books, scientific papers and significant articles regarding sea-run (anadromous) brook trout. NB: Not all what you read is true. Fishermen, fisheries historians and scholars please note, the literature below is only presented as historic record. Much of what is written and published by otherwise revered authorities turns out to be seriously in need of revision – and the closer we look, the more we find this to be true. I was struck by Steve Hurley’s comment one day when he said “Jerome VC Smith wasn’t much of an ichthyologist” so I was drawn into deeper reading. I hope someday someone writes an article or thesis that sets the record(s) straight. The same goes for both Mullan and Ryther below. See if you can find the mistakes. If you come across material that should be on this list, by all means reach out to us or comment in the comment section below. Our list starts with Dr Jerome VC Smith’s seminal work and several other key works from more recent time and then proceeds alphabetically. While best read in the original 1833 edition, Smith is also available in reproduction or through Google Books. SRBTC quotes liberally from this document; if anyone wishes to pursue this topic in depth, this is the place to start. Through the magic of Google, it is also fully searchable. You can start by searching on known Cape Cod streams including the Santuit, Quashnet and Marshpee (aka Mashpee) rivers. Expect odd spellings as this was the early 1800’s. A quick note about the study of Fisheries History. In the early days, there was no consistent naming used for Salvelinus fontinalis. As such, there is much speculation about the actual presence or absence of these fish as documented in original literature as this fish might have been referred to by one of any number of names, notably “little salmon” and “sea trout” -or as a nod to our friends to the North “slob trout.” Nick Karas’s book covers this in great detail. You may come upon your own discovery as did SRBTC co-founder Michael Hopper who came across mention of a “trout camp” in a book about the art of Frank W. Benson, referenced below. Once a stream has historical documentation of a population of these unique fish, additional attention can be paid to research and restoration of the system. 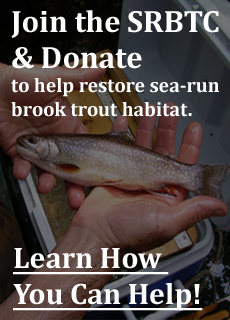 Please reach out to us if you come across historical or anecdotal reference of sea-run brook trout. Please also reach out to us if any of these downloads or links fail to work. Ryther, John H. Anadromous brook trout: Biology, status and enhancement , 1997 Trout Unlimited. Bedford, Faith Andrews; The Sporting Art of Frank W. Benson, David R Godine, 2000. To those readers who live further south, I’ve been involved with the preservation of southern NJ’s last wild trout stream. My book “Saving Mason’s Run” is available on Amazon and all proceeds go to TU conservation. Try SQUARETAIL by Charles Kroll, 1972. I no longer have a copy, but it is so comprehensive in scope that it likely does mention sea-runs. I do recall that it mentions “coasters”.